If one fancies walking across high bridges there is yet another experience for them in the railway viaduct from San Romano di Garfagnana to Poggio on the line which carries on from Bagni di Lucca, past Castelnuovo di Garfagnana to eventually reach Aulla. There is a special pedestrian walkway on the left hand side of the viaduct crossing one side of the valley to the other and giving beautifully long views up and down the Serchio valley. This viaduct can easily be incorporated in a longer walk. Below the start of the viaduct there’s a house. I wouldn’t particularly like to live under one of these arches especially if there are litterbugs travelling on the train above, but the house does have extensive flat lands around it. Another delight of this area is the village of Sambuca, the smallest in the comune of San Romano, dating back to the tenth century. It’s very picturesque with its church of San Pantaleone and its houses scattered and perched between giant black rocks called dogli. The Serchio flows nearby and contains some wonderful rock pools brilliant for bathing. Who really needs a swimming pool when there are these? I was looking at these photos yesterday morning when there seemed to be nothing much to cheer one up with the continuous rain. (It did clear up in the afternoon, however). Sometimes there was little information about the pictures apart from when they were taken. Then I discovered that I had a huge archive stretching back to when I first moved here – my emails. Just using Gmail I found that I had sent these pictures with descriptions to those who had been with me on walks and visits – eight hundred alone to one person and thirty thousand emails in all! It’s going to be a tough job for future social historians to make sense of the vast amount of data we are accumulating through the use of digital photography and emails – if we decide to keep them. (There is currently talk of legislation which would allow effective wiping out of personal data on one’s decease if one decides on this). Selection, of course, is the answer. I was amazed to find also that Picasa, a photo organizing programme I find particularly useful for re-sizing pictures down to five hundred pixels for use on the web, also has face recognition built into it: find a photograph of someone, give it the name of the person and the computer will scan for all similar likenesses. Absolutely fabulous. I’ve grouped well over seven thousand picture of my wife alone from many, many years. Do we really change that much then? It would be also great if there could be programmes that recognise places where one took the photographs. At least, I have some memory and those emails to locate these pictures which I took on Midsummer Day 2006. Yesterday, Bagni di Lucca Villa itself had diversions since the ancient roof beams of its town hall were being replaced – in this weather! Let not the town hall (a rather magnificent sixteenth century building where weddings can also be celebrated -see http://longoio.wordpress.com/2014/06/01/bagni-di-luccas-wedding-bells/) collapse if everything else does! 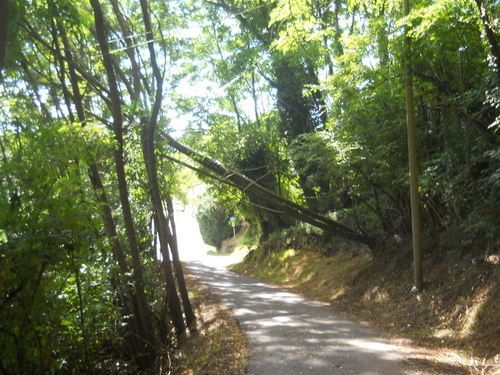 Does anyone remember, however, the time when Ponte a Serraglio and Villa at Bagni di Lucca were cut off from each other by a landslide in March 2008 for at least two months? Tourism has clearly suffered, especially the seaside resorts like Viareggio which now have (for them, too, unusually) weather approaching places like Barmouth and Scarborough. Perhaps those nostalgic for an English seaside holiday might take a sentimental trip to the Versilia coastal resorts today? At least Italy has got plenty of indoor activities – mainly its wonderful museums and palaces … when they are open and, at least Bagni di Lucca has its Arts Festival (and several children’s activities) among which today will be the inauguration of the new river installation. 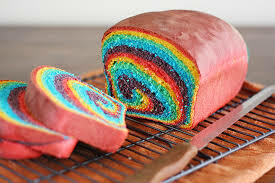 Remember last year’s? Alexandra de Requesens, Arnau Tàssies, Ana Huerta, Clara Romani, Eva Vera, Pau Garcia and Samuel Angulo – Collective Group – 3D NEIGHBOURS. Italy abounds in religious processions centred on a town’s patron saint or holy relic, especially in the south. Recently there was a news item in which the priest leading a procession in a Sicilian town was heavily ticked off for allowing it to halt and get the Saint’s statue to bow before the house of a well-known mafia chief (who had apparently also helped to sponsor the event). 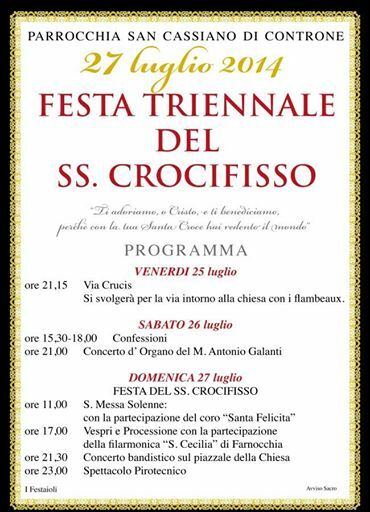 San Cassiano’s Festa Triennale del SS Crocifisso (Feast of the Very Holy Crucifix, celebrated in grand style every three years) has fortunately no such shady associations. It is a very moving festival of the religious and community spirit of the area, bringing together not only the inhabitants of the surrounding villages but also relatives who have emigrated to the Americas and northern Europe. For an anthropologist the Festa is a complete vindication of Durkheim’s concept of “collective effervescence” and the identification of God with Society. The intermixing and fusion of the sacred and the secular can be felt throughout the three days of this wonderful occasion, both for San Cassiano and for the entire Valle di Lima. The High Mass I attended on Sunday was brightened by the glorious singing of the San Felicita choir from Lucca who sang organ-accompanied plainsong with a delightful alternation of men’s and women’s voices. I returned in late afternoon for the Vespers where the most spectacular part of the celebration takes place. The fourteenth century and wonderfully expressive crucifix, which normally resides in a side chapel to the right of the high altar, has been positioned above the altar on a pedestal placed on a trolley on a carmine-covered “railway”. A cable then lowers it at the slowest of paces, just like a San Francisco cable-car, until it reaches the safe hands of the bearers who place poles through the pedestal and carry it with the maximum care (low entrance door!) out of the church into the bright sunlight. For the sun always shines when the crucifix is brought out – even yesterday when storm clouds broke out in the morning and were threatening for much of the day. No-one can remember the procession ever being cancelled because of bad weather! The band of brass and wind instruments playing various religious songs. The route taken by the procession is a symbolic “beating the bounds” and is meant to instrumentalise the imparting of blessings by the holy crucifix on the entire parish area for good crops, fertility and avoidance of pestilence and war. It’s virtually like a gigantic house blessing. 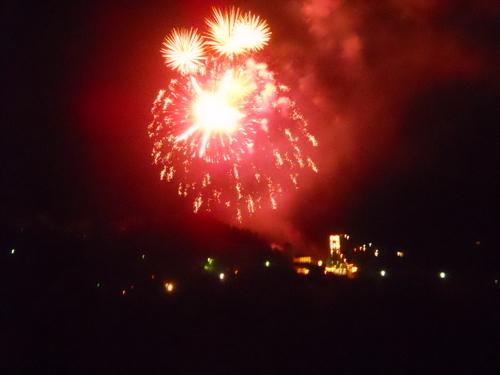 I returned in the evening to witness a fabulous fireworks display over the illuminated church of san Cassiano. It’s wonderful that these events can still happen in the difficult times Italy is still passing through. True, there may be fewer people present than once – so many have emigrated. All the features of the ancient rites are there, however, as is the very Italianate sense of solemnity and jollity of this glorious event. I do hope I shall still be here in three years’ time to witness this great communal outpouring again! It is so very special and shows that Italians have an innate sense of organisation and order when it comes to their village celebrations that the government they labour under would do well to emulate. Placing a large plastic sheet supported by posts over the water tank so that any rainfall could be funnelled into the tank. Using a water diviner to track the water course running under our field. Getting an extra connection of water from the mains. Digging a large hole and lining it with plastic sheeting so that it could collect rain water. Driving rain and strong winds could soon blow the plastic sheet away even before it started channelling water. Even if the water diviner was successful, a borehole would have to be made. This could go down to an aquifer possibly at least one hundred feet below and would prove very expensive indeed. The water company only connects water to land occupied by a resident. Our land was farmland and no connection was possible. In the end we decide on solution 4. The wood-cutter’s little excavator was brought into my olive grove, skilfully manoeuvred by one of his sons. The hole was dug to a metre’s depth and is able to contain two and a half thousand litres. The bottom and sides of the hole were smoothed off to provide no jagged edges for the laying of the plastic sheeting. I hadn’t realised the complexity of the controls on a mechanical digger. The son was a virtuoso with it as much as a pianist can be on the ivories. The sheet was laid and the sides held down by the earth so that the displaced earth actually formed a nice embankment round it. 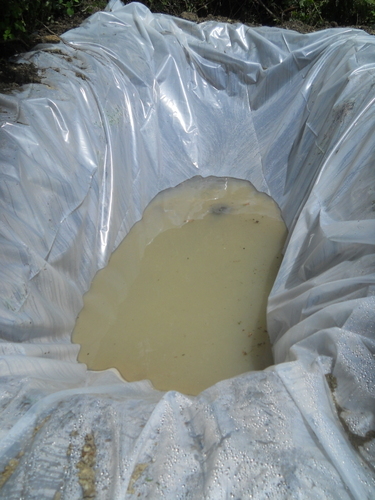 In fact, the exercise was similar to making a giant duck pond (see “Duck!” post) except that plastic sheeting was used instead of a pre-formed shape and there was the advantage of machinery. The whole work took little more than two hours and my relief at seeing how an intractable problem could be solved with such obvious and simple means was great. Now all that needs to happen is for it to rain which, judging, by the dark clouds hovering around our valley at this moment, is sure to occur very soon. Many people have been surprised that at a height of almost six hundred metres we are able to have capers growing from various exterior walls of our house in Longoio. My wife likes to pick the pods and pickle them. Capers make even a cheese toast a gourmet’s delight! 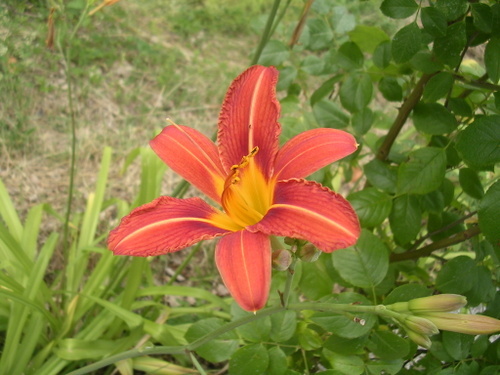 I enjoy the buds blossoming into the most beautiful flowers. There are enough capers to satisfy both senses of taste and sight! The photos I took of our capers the other morning make some of them look a little bedraggled: there was heavy dew. 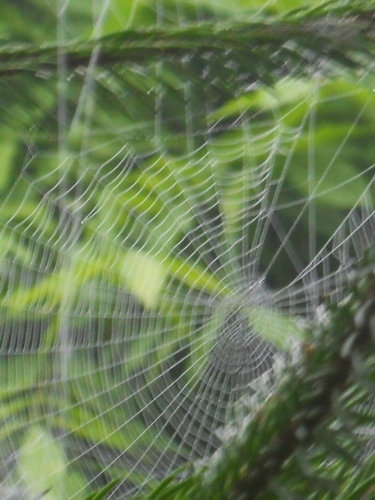 You could even see the cobwebs clearly enough on our ex-Christmas tree. Capperi! An exhibition of photographs of mural painting throughout the world (“Murales nel Mondo”) taken by Piero Berti, was inaugurated on the 21st of July on the upper floor of Bagni di Lucca’s Circolo dei Forestieri, runs until the end of this month and is open daily from 4 pm to 7 pm..
It’s a pity that the exhibition runs for such a short time and has such awkward opening hours because its subject matter is most interesting and I certainly expanded my knowledge of mural painting by visiting it. The first thing to remember is that painting on walls (wall in Spanish = mural) has nothing to do with graffiti which are based on individualist and letter-based concepts. 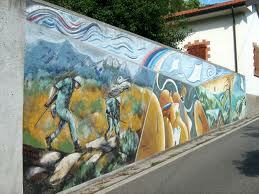 A Murale is essentially a community project and expresses, in allegorical terms, political and cultural concepts. Unfortunately, many murals in cities may lose this community inspiration and be disfigured by graffiti through individuals re-defining their tribal territories. Having said this, there are several murals which combine both figurative and lettering schemes successfully. This is certainly the case in Northern Ireland where in places like Belfast and Derry it has reached its utmost development within an emotive political situation. I first came across murals when, as a youngster, I hitched across Mexico. There, muralism as an art movement sprang up as a result of the 1910 revolution and was developed to great heights by people like Diego Rivera (whose mural masterpiece adorns Mexico city’s town hall) and José Orozco. Muralism may, of course, be regarded as much older than 1910. Not only are the great fresco cycles in Italy aspects of muralism but it must also be remembered that in many parts of Italy the exterior of buildings are, or have been, adorned by murals. 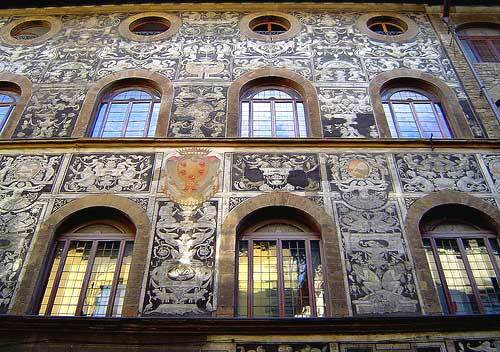 In Florence, the technique of sgraffito (a sort of reverse-painting technique where the design is produced by literally scratching off layers of different coloured paints as in Bianca Cappello’s house) was particularly popular. 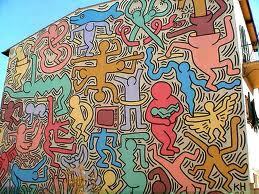 Closer to home and our times, the most famous Murale is Pisa’s Universal Peace wall painting by American Keith Haring (who died of AIDS aged only 31 in 1990). Even closer to home are the murals of Lizzano (well under an hour’s drive from Bagni di Lucca although they are in Pistoian territory). These murals were painted by the “Donatello” group of artists, some coming from Florence. They, too, are peace-praising Murales and were inspired by the story of an American sergeant whose life was saved through the local inhabitants’ bravery during WW2 (Lizzano is near the Gothic line) and who then decided to became a priest. I can’t think of any murals in Bagni di Lucca although I feel that the current arts festival could inspire at least one. Murales, of course, require community spirit and consent, as happened in Lizzano. Perhaps next year? To return to the exhibition at the Circolo dei Forestieri, some criticism: three flights of stairs may be a tall order for less-able people: a lift is a prime necessity for equal access if the lovely space is to be regularly used for exhibitions. Each photograph should be labelled individually instead of having to return to a single printed sheet with numbers stating photo locations every time one wants to know more information about the photographs. Furthermore, the location descriptions could be more detailed. The lighting is not very good and the reflexive glass which covers the photos gets into the way. Despite these strictures I found the exhibition both insightful and instructive.